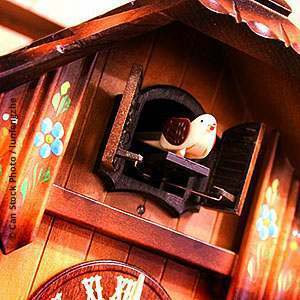 Welcome to our shop for original Black Forest cuckoo clocks. The location of our company is St.Georgen, in the middle of the famous Black Forest in Germany. Here in this area was once born the idea of ​​a clock with moving bird. And here arose the first original Black Forest cuckoo clock. The tradition of these lovingly decorated and detailed clocks is already very old and dates back to the 19th century. Today, cuckoo clocks are famous and popular products with the seal "Made in Germany" all over the world. Whether as a gift, souvenir, status symbol or because of a hobby - with a Black Forest cuckoo clock you will have a lot of joy. In our shop you will find cuckoo clocks in the chalet style of black forest houses, classic cuckoo clocks with carvings as well as modern cuckoo clocks in trendy design. Most of them carry the well-known VDS certificate, which underlines the special quality class "Made in Germany". When buying a clock with the VDS certificate, you can be sure that it is an original Black Forest cuckoo clock. All production steps up to the fitting of the clock take place here in our proximity - in the middle of the Black Forest. Mechanical cuckoo clocks provide only one requirement to the owner: they must be reared. For this purpose, the weights on the chain hoist of the Black Forest cuckoo clock are each pulled upwards by hand and then moved downwards again by the gravitational force. The movement is driven by the resulting force. The trigger mechanism of the beat is blocked until the minute hand reaches the 12 o'clock position. Then a series of mechanisms are triggered and the clock begins to beat and the cuckoo calls. Classic handmade Black Forest cuckoo clocks are not only attractive to look at, but are also a genuine piece of tradition from the Black Forest. The complicated technology is rather confusing for outsiders, but the design fascinates any technology fan. Black Forest cuckoo clocks, no matter what shape, have one thing in common: they are only original when they have been hand-made in the Black Forest.